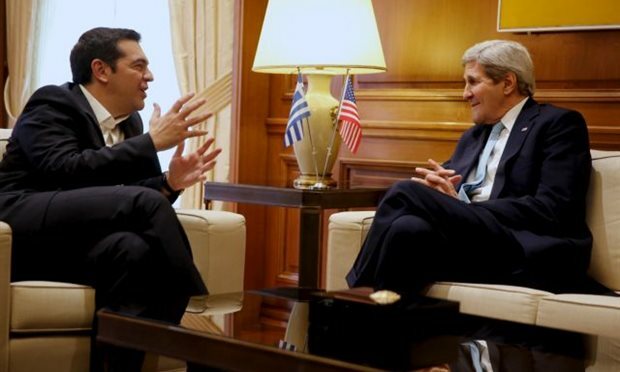 US Secretary of State John Kerry is on an official visit to Athens today (4.12) for talks with Greek Prime Minister Alexis Tsipras and Foreign Minister Nikos Kotzias, on a broad range of bilateral and regional issues. Security in light of recent developments on the crisis in Syria and terrorist attacks in Europe, is expected be high on the agenda as well as the migrants and refugee crisis, Greece’s relations with Turkey and the Cyprus issue. Another major topic of discussion will be strategic energy cooperation, particularly regarding Europe’s gas supply and the progress in the construction of LNG shale gas terminal stations in Revythousa and Alexandroupoli and the Trans Adriatic Pipeline (TAP) and the Gas Interconnector Greece-Bulgaria (IGB) pipelines. Kerry is coming to Athens after a one-day visit to Cyprus, yesterday (3.12), where he referred to “tangible progress" in terms of the Cyprus issue and that a solution was within reach, following separate meetings with Cypriot President Nicos Anastasiades and Turkish Cypriot leader Mustafa Akinci. Kerry noted that the international community has a responsibility to support a comprehensive and lasting solution for Cyprus, which will have an enormously positive impact on the island, it will lift up the entire region and it will serve as a model for other embattled countries.